Semto Mechal | Psalm 38:13-14 But I, like a deaf man, do not hear; And I am like a mute who does not open his mouth. Thus I am like a man who does not hear, And in whose mouth is no response. Psalm 38:13-14 But I, like a deaf man, do not hear; And I am like a mute who does not open his mouth. Thus I am like a man who does not hear, And in whose mouth is no response. To many people the monk seems remote and unsociable. It seems that he is concerned with his own soul and that he offers nothing to the Church or to the world. That is not the case. If the Church has been preserved for so many years, this is due to monasticism. The person who enters a monastery and offers everything to Christ enters into the Church. Perhaps someone will ask, ‘Do those who live alone in a cave help the Church?’ The answer is ‘yes’. The cave-dwellers help the Church in a mystical way. A monk who lives in a cave may not cultivate trees and vegetable gardens, he may not write books and do other things that help towards spiritual life and progress, but there he creates and develops and is assimilated to God. Hermits stay in caves so that no one distracts them from the spiritual life. With their fervent and pure life and above all with their prayer they help the Church. I’ll say something that will seem grossly excessive to you. But I want you to believe it. It is about the contribution of a monk’s prayer. Listen to me carefully. Let us assume that there are seven educated preachers, who live holy lives. Their rhetorical skill is unparalleled. Each has a parish with ten thousand parishioners. Thousands who hear them are moved to repentance and return to Christ. Whole families are saved. Nevertheless, one monk who no one sees and who sits in a cave somewhere has a much greater effect with his humble prayer. One produces a greater effect than seven. That is what I see. I am sure of it. That is how important a monk’s prayer is. He is on his own in his cell, but the reverberations of his prayer reach everyone, even if they are far off. With his prayer, the monk participates in all the problems which people face and works miracles. His contribution, accordingly, is greater than that of the most gifted and worthy preacher. Excerpt from a book, Wounded by Love, The Life and the wisdom of Saint Porphyrios, page 171. Consequently, the next day someone, if he is honest with himself, will admit that although yesterday he gave his whole self to God, today he feels as though he must give himself again to God, as a new state has arisen within him. In the spiritual life it is in this way that one makes a start and again makes a new start, giving himself again and again to God. And, if one does this both honestly, and honorably, he progresses and someday arrives at a state where he has finally given his whole self to God. And because of this the saints don’t have what we have: a conscious, a subconscious and an unconscious. No; their entire being is transparent before God. In this way, the saint controls himself completely. Never does a saint feel that within him exists states that are crude and dark, let’s say, a basement of the soul, states that he doesn’t know, and doesn’t control. The saint doesn’t have such things. Why are you concerned about your opinions? I do not like this…, “Why is it like this? Why did he tell it like this? I would have told it better. Why did he do that? Etc.. These are the biggest evil and badness. This is exactly what got Judas to deny Christ. So the question, should be directed at me only. Christ said, why have you forsaken me while on the cross? But when it comes to those who crucified him, He says ‘Forgive them for they know not what they do’, eventhough what they were doing was completely wrong. So logical and rational thinking can make us deny Christ today, God forbid, if we don’t focus on our own brokeness. That is the kind of love we want for our marriage or for our friendship to last for a life time. No love can grow without trust. We are called to love by our God. Trust is the base of love. We are talking about confidence, trusting and believing in people. That is what love is actually. I trust my fellows and that I have confidence in them. Love and trust are intertwined. They go hand in hand. There are three kinds of people in the world. The first is the gullible people. People who are naive and believe everything and anything. And that is the fear of most of us to be gullible. The second is the cynical people who do not believe anything. They are suspicious and skeptical of everything. The third is the healthy people that can love and give people the benefit of the doubt. What if we are not healthy? Which option is much safer and much wiser for us? To be more believing and trusting people or be more skeptical. I think the natural response is to be skeptical. A lot of pyschological studies have been done and the finding was that one of the saddest people in the world are skeptical people. And the characteristic of the happiest people in the world are people who are more trusting. The worst thing that could happen when we are trusting too much is that we will be burned. People will abuse our trust. But which is better? That our trust is abused once or twice or ten times and we live happy for the rest of our lives or live skeptical having no relationship with anyone and afraid of anyone all our lives because we are afraid to be burned once or twice or even ten times. And to live sad and lonely all our lives because we are skeptical of people. They actually did some IQ test because they thought that the gullible people had less IQ. But the test showed otherwise. Trusting people have better IQ. Trusting people know what they are doing. It is a choice. When we stop trusting people, then we stop relating to people and stop loving people. If we don’t relate well then we breaking the commandment of love neighbor. We can never say we love people without trusting them. Trust means giving people a second chance when they mess up. For example, we don’t leave a small group and say I will never come to this small group again. Or say I am never going to speak to this person again saying he/she embarrassed me and abused my trust. Love that trusts gives a second chance. How many chances have we gotten from our good Savior? We can’t take this decision without giving a second chance. For example, we mess up in a game and a good coach will let us play again. But a bad coach will put us on the side and the self-esteem is down and we end up hating to play and hate the game all together. Or when a youngster gets into an accident or someone who just started to drive gets into an accident, the worst thing is to tell this person to never drive again. But the best thing is right after the accident, to let them use the car and start driving. Give them a second chance saying, I trust you. Very important to give this grace to people. How many times we did something stupid by mistake and people punished us for the rest of our lives because that is a stupid mistake? And how many times when we were given a second chance that we were so appreciative of that and we did our best because we are given a second chance. Sometimes it is very hard to trust certain people. How do we trust? How can love believes all things? When we are trusting people because of God and His commandments and because of the love and relationship, we are not really trusting them but we are trusting God. We are taking a huge risk but it is a step of faith. We are trusting God. We are not trusting the people at hand. Sometimes, we lose this trust even with God. When God does something we don’t understand, we don’t give Him a second chance either. We say O you messed up this, I am not talking to you again. We say to Him you don’t love me and this and that. When we fall into this trap, we need to recite the following verse. We don’t understand the wisdom of God but we should trust Him. One of the greatest gift that we can give anyone is the gift of trust. Same way that God trusted us, the same way that God has given us more than we deserve, we should trust other people as well. May God grant us His abundant grace to do just that. Amen. Many people know the truths of the Bible relatively well. They can recite many of the Ten Commandments and articulate key principles for Christian living. They believe wholeheartdly they should be living them. The problem is they don’t know how! Almaz is a gifted manager in her company. She has been a Christian her whole life and loves spending time with God. When the vice presdient of her company was making schedules for mangers to meet clients out of town, he asked Almaz to pick up the weeks she would prefer to travel over the next three months. Within the week Almaz emailed him the dates and eagerly awaited his confrimation. None arrived. Almaz called his office the following week. Almaz sat stunned in her chair. “Thank you, “she replied robotically and hung up. For the next two weeks Almaz wrested with God and herself. She asked God for forgiveness for the anger she was feeling. She tried to figure out why the vice president had changed his mind. She humbled herself to God. She cried out in prayer for love toward her coworkers. She lost sleep. Finally, she concluded God was dealing with her stubborn self-will. Over time Almaz distances herself from the vice president and other managers, avoiding them whenever possible. During the next two years she worked hard, but she felt like she had hit a ceiling in how far she could go with this company. Eventually, she took a position with another company. Even though, Almaz is committed to the Lord Jesus Christ, her commitment does not include relating well to people in an emotionally mature way. Instead, she misapplies biblical truth and follows, most probably, the relational skills learned unconsciously in her family growing up. What assumptions is she making about her vice president? His administrative assistant? About God’s will for her life? What might she have done to prevent her pain? To preserve her relationships at work? Unless Almaz receives equipping in this area, she will likely repeat the same pattern over and over again. Part of growing into an emotionally mature Christian is learning how to apply practically and effectively the truths we believe.
. Recognize, manage, and take responsibility for their own thoughts and feelings.
. Can, when under stress, state their own beliefs and values without becoming adversarial.
. Give people room to make mistakes and not be perfect.
. Appreciate people for who they are—the good, bad, and ugly—not for what they give back.
. Accurately assess their own limits, strengths, and weaknesses and are able to freely discuss them with others.
. Are deeply in tune with their own emotional world and able to enter into the feelings, needs, and concerns of others without losing themselves.
. Have the capacity to resolve conflict maturely and negotiate solutions that consider the perspectives of others. Almaz did not have the skills and emotional maturity to resolve her conflict maturely. She also did not have the ability to state her feelings and beliefs without thinking adversarially. The end result was an isolation and coldness in her relationship at work that resembled hell more than heaven. A tragically misinterpreted verse in the New Testament is Jesus’ proclamation: “Blessed are the peacemakers, for they will be called sons of God” (Matthew 5:9). Most people think that Jesus calls us in this verse to be pacifiers and appeasers who ensure that nobody gets upset. We are to keep the peace, ignoring difficult issues and problems, making sure things remain stable and serene. When, out of fear, we avoid conflict and appease people, we are false peacemakers. For example, Achame is engaged. She would like more time to rethink her decison but is afraid that her fiance’ and his family will get angry. She goes through with the wedding. She is a false peacemaker. The way of true peace will never come through pretending what is wrong is right! True peacemakers love God, others, and themselves enough to disrupt false peace. Jesus models this for us. Many of us believe loving well is learned automatically. But we need to have some tools and excercises to learn how to love. We need to ask God prayerfully to help us to love and relate well with others. Besides prayer, we need to look two things very carefully namely assumptions and expectations. Checking out assumptions is a very simple, but powerful tool that elimnates untold number of conflicts in relationships. It enables us to check out whether what we are thinking or feeling about others is true. It enables us to clarify potential misunderstandings. Every time we make assumptions about someone who has hurt or disappointed us without confirming it, we believe a lie about that person in our head. This assumption is a misrepresentation of reality. Because we have not checked it out with the other person, it is very possible we believe something untrue. It is also likely we will pass that false assumption around to others. When we leave reality for a mental creation of our own doing (hidden assumptions), we create a counterfeit world. When we do this it can properly be said that we EXCLUDE God from our lives because God does not exist outside of reality and truth. In doing so we wreck relationships by creating endless confusion and conflict. Almaz, in our opening illustration made all sorts of assumptions about why the boss failed to schedule her to meet with clients. Her life was driven by these assumptions in her head, which mostly likely were false. Unmet and unclear expectations create havoc in our places of employment, classrooms, friendships, dating relationships, marriages, sports teams, families and churches. We expect other people to know what we want before we say it. Expectations are only valid when they have been mutually agreed upon. We all know the unpleasant experience of other people having expectations we never agreed to. One of the greatest gifts we can give our world is to be a community of emotionally healthy adults who love well. This will take the power of God and a commitment to learn, grow, and break with unhealthy, destructive patterns that go back generations in our families and cultures—and in some cases, our Christian cultures also. Lord Jesus Christ, Son of God, have mercy on us. Lord, we have unhealthy ways of relating that are deeply imbedded in us. Please change us. Make us a vessel to spread mature, steady, reliable love so that people with whom we come in contact sense Your tenderness and kindness. Deliver us from false peacemaking that is driven by fear. Lord Jesus, help us love well like you. 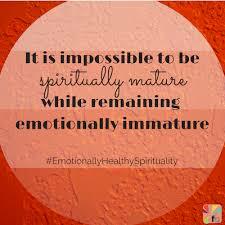 Grow us, we pray, into an emotionally mature adult through the Holy Spirit’s power. In Your Holy name, Jesus. Amen. Excerpt taken from a book Emotionally Healthy Spirituality by Peter Scazzero. Semto Mechal on Want to experience God? larryzb on Want to experience God?